At African Portfolio we strive to personalize every itinerary and use our insider knowledge of Africa to plan unique safaris for all our clients. Cape Town is one of the many destinations that we are intimately familiar with and love to visit. We stop by at least once a year and always discover something new to see and do. Planning a Cape Town itinerary really gets our creative juices flowing, but can be mind-boggling for our clients trying to figure out what to do. This is where we at African Portfolio can take the mystery out of the process, and leave the magic in your experience! 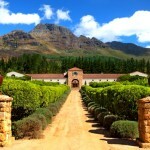 8 am – 9 am — Enjoy breakfast at your Cape Town hotel, and then pack your bags for a night or two in the Winelands. 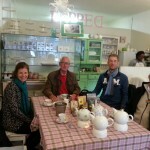 A driver will pick you up and transfer you to Stellenbosch to start the Cape Cuisine Walk in the late morning. 10.30 am – 2.30 pm — The Cape Cuisine Walk is a 4 hour expertly guided tour at an easy walking pace, that takes in the gorgeous historic sights of Stellenbosch (Yvette’s home). There are several stops along the way where you get to sample a wide array of delicious traditional South African foods, from rusks to biltong; bobotie to koeksisters. 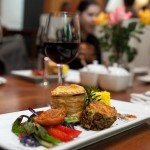 Wash it all down with a cup of Rooibos tea or a glass of the finest regional wine. The tastings and tours take you to a local butcher, sweetshop, and tea house, offering a unique and fascinating insight into local culture that you would surely miss on a “cookie cutter” tour of the region. 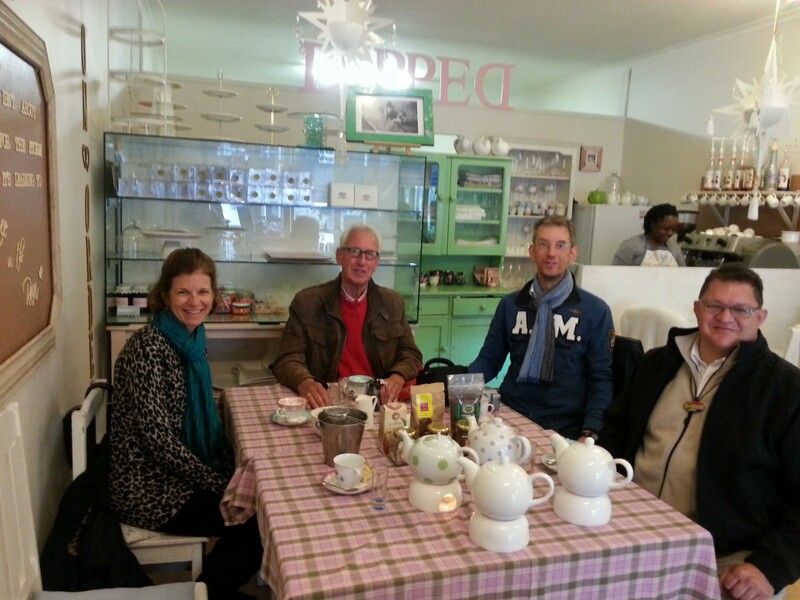 The tour also includes lunch at the historic D’Ouwe Werf, South Africa’s oldest hotel established in 1802. 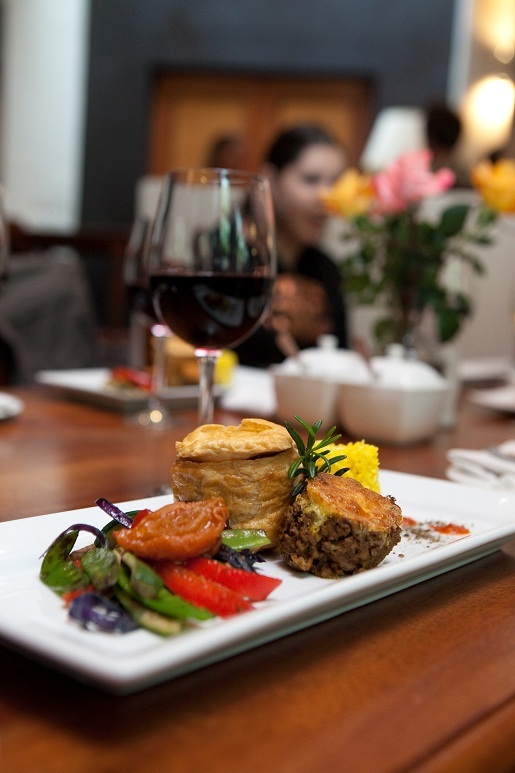 Lunch offers a sampling of South African favorites re-created with a gourmet twist by chef Albert van der Loo, such as Cape Malay bobotie, homemade chicken pie and beef frikkadel with wines to match. With the fine flavors of South Africa’s traditional foods lingering on your palate, it’s time to get serious about wine. This area is after all a mecca for wine enthusiasts, and what better way to introduce the region’s fabulous wines than a wine safari in an open 4×4 vehicle. 3.00 pm – 5.00 pm — The Waterford Estate is the setting for our next activity — a two hour wine safari in an authentic 4×4 safari vehicle with open top. Waterford Estate is situated in one of the world’s most visually arresting pockets of paradise. 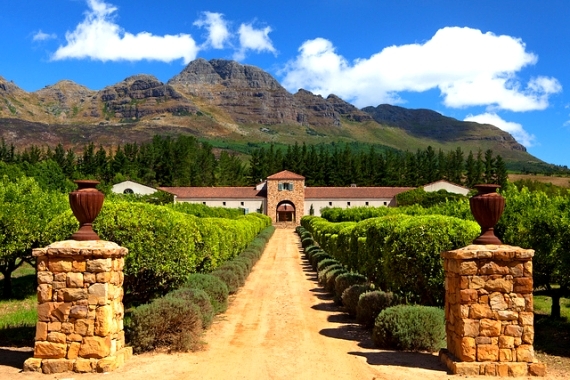 Nestled in the picturesque Blaauwklippen Valley, in the world-renowned Stellenbosch region, this 120-hectare property boasts ancient citrus groves, rolling lawns, water features and fragrant lavender beds. The winery was designed by architect Alex Walker and created from quarried local bedrock, stones from the vineyard and timber grown on the estate. It was styled along the engaging terracotta design of the classic Bordeaux chateaus of France. The two hour, 4×4 wine safari not only offers you the chance to taste the award winning wines in the vineyards of their origin, but you will be expertly guided through all the aspects of what makes this area so bio-diverse and viticulturally unique. Having experienced the terroir that makes the Waterford wines so special and tasted the effects it has on the wines, you then return to the winery and take a tour of the cellar, or indulge in the Wine & Chocolate Experience. The Wine Safari will end in the late afternoon, where we arrange for you to be transferred to your hotel in the area for some rest and relaxation before dinner. Contact us for more details about this itinerary and let us help you plan your perfect safari!